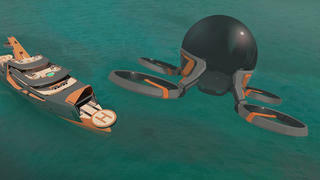 British studios Henry Ward Design and BMT Nigel Gee have teamed up to create a radical superyacht concept called Project Time. 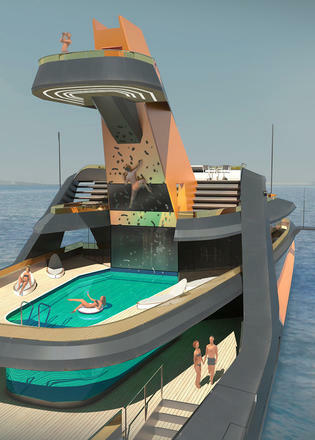 This 66 metre design celebrates the greatest luxury on earth — free time. One aspect of this is the sheer amount of time you can spend on board, should you wish. Project Time would be fitted with a twin 2,039hp azi-pod drive system for a globetrotting range of 6,000 nautical miles, more than sufficient for crossing oceans or visiting remote superyacht destinations. 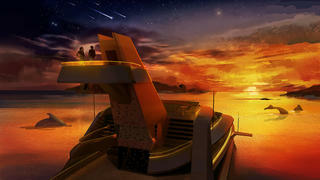 British studios Henry Ward Design and BMT Nigel Gee have teamed up to create a radical superyacht concept called Project Time. 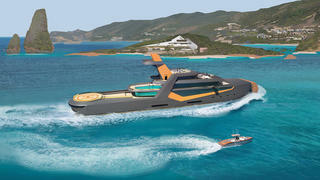 This 66 metre design celebrates the greatest luxury on earth — free time. One aspect of this is the sheer amount of time you can spend on board, should you wish. Project Time would be fitted with a twin 2,039hp azi-pod drive system for a globetrotting range of 6,000 nautical miles, more than sufficient for crossing oceans or visiting remote superyacht destinations. Privacy is paramount for many owners and Project Time takes this to the next level with an 18 metre detachable lodge, which has its own propulsion system for exploring shallow bays or remote coves. Inside the lodge is an owner’s cabin, a second guest cabin and an open-plan saloon, ideal for enjoying private family time away from the mothership. Privacy is paramount for many owners and Project Time takes this to the next level with an 18 metre detachable lodge, which has its own propulsion system for exploring shallow bays or remote coves. Inside the lodge is an owner’s cabin, a second guest cabin and an open-plan saloon, ideal for enjoying private family time away from the mothership. If you need to get back to base in a hurry, Project Time’s autonomous passenger drone is the ideal solution. Housed in a hangar in the bow, this four-person capsule can also be used for exploring, with touch-screen controls allowing for effortless flight. With lift provided by four propellers, this drone draws on ideas developed for some of the world’s most amazing private jet concepts. 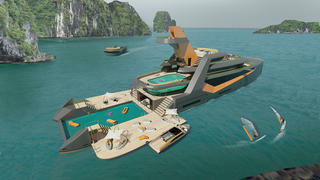 Beach clubs and superyacht pools are two popular features amongst the world's largest yachts, but Project Time combines the two, with a fold-out section that is revealed when the detachable lodge is undocked. Key features here include an eight metre pool surrounded by 190 square metres of external relaxation spaces, complete with sunpads and a poolside bar area. 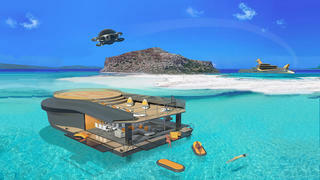 Beach clubs and superyacht pools are two popular features amongst the world's largest yachts, but Project Time combines the two, with a fold-out section that is revealed when the detachable lodge is undocked. Key features here include an eight metre pool surrounded by 190 square metres of external relaxation spaces, complete with sunpads and a poolside bar area. Standing 15 metres above sea level, the raised observation deck on board Project Time is the ideal spot for admiring your surroundings. This special viewing platform can be accessed from the sundeck, which is a great place to unwind, with a massage room and sauna. The raised observation deck isn’t the only way to make the most of Project Time’s towering seven-deck superstructure, though. This spectacular climbing wall reaches underneath the viewing platform with an overhang design that will challenge even the hardiest of rock climbers. And when you can’t hang on any longer, you can simply let go of the handholds and splash down into the swimming pool below. BMT Nigel Gee has carried out an initial feasibility study on the naval architecture of Project Time, so all that is missing is a seriously forward-thinking superyacht owner. The raised observation deck isn’t the only way to make the most of Project Time’s towering seven-deck superstructure, though. This spectacular climbing wall reaches underneath the viewing platform with an overhang design that will challenge even the hardiest of rock climbers. And when you can’t hang on any longer, you can simply let go of the handholds and splash down into the swimming pool below. BMT Nigel Gee has carried out an initial feasibility study on the naval architecture of Project Time, so all that is missing is a seriously forward-thinking superyacht owner.